When it comes to buying shoes for your beloved dogs, trust Puppy Love Anti Skid Sock Shoes. 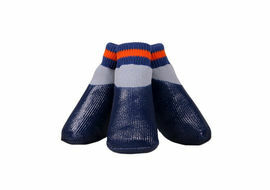 These sock shoes are not just easy to put in to your pets, but they provide easy breathing space to the paws as every dog has a tendency to spread their digits while walking. 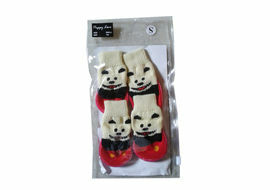 It offers easy expansion of the paw inside the socks. Vitrified tiling and marble flooring are commonly found in urban households. Such flooring could lead to serious injuries and hip displacement in dogs. 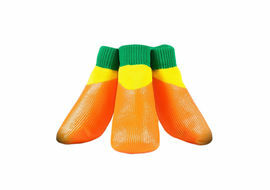 These anti-skid sock shoes from Puppy Love provide easy traction which lets them grip on slick floors. Most importantly they come useful for hip and ligament issues and arthritis. For senior and injured dogs, Puppy Love Anti Skid socks are highly recommended by veterinary doctors. The broader base of anti-skid sole is made of high quality rubber which gives a firm grip to dogs walking on urban flooring. 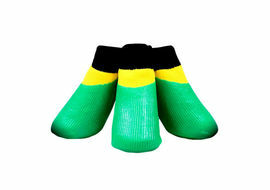 · These sock shoes prevent nail marks and scratches on hardwood floors and car interiors. Unlike hard shoes, anti skid sock shoes are easy to use – just pull it over the paws and your pooch is all set to rock and roll. · 100% washable. Can be used for limited outdoor use as well. Just remove and toss it in your washing machine while washing. When it comes to buying shoes for your beloved dogs, trust Puppy Love Anti Skid Sock Shoes. These sock shoes are not just easy to put in to your pets, but they provide easy breathing space to the paws as every dog has a tendency to spread their digits while walking. It offers easy expansion of the paw inside the socks.Vitrified tiling and marble flooring are commonly found in urban households. Such flooring could lead to serious injuries and hip displacement in dogs. 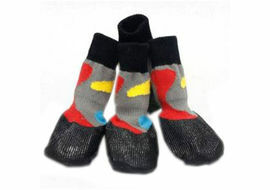 These anti-skid sock shoes from Puppy Love provide easy traction which lets them grip on slick floors. Most importantly they come useful for hip and ligament issues and arthritis. For senior and injured dogs, Puppy Love Anti Skid socks are highly recommended by veterinary doctors. The broader base of anti-skid sole is made of high quality rubber which gives a firm grip to dogs walking on urban flooring.Benefits: · These sock shoes prevent nail marks and scratches on hardwood floors and car interiors. 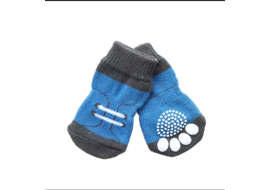 Unlike hard shoes, anti skid sock shoes are easy to use – just pull it over the paws and your pooch is all set to rock and roll.· 100% washable. Can be used for limited outdoor use as well. 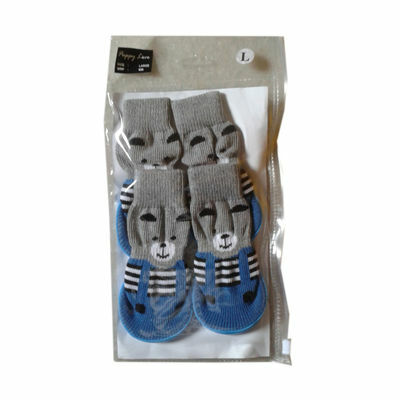 Just remove and toss it in your washing machine while washing.Content:Set of 4 sock shoesDesign / Look:Teddy Bear Size Chart: SIZE CHART - ANTI SKID SOCK SHOES SIZE HEIGHT WIDTH From middle finger to front ankle From 1st finger to 4th finger XS 4.0 cms 4.0 cms S 4.5 cms 4.5 cms M 5.0 cms 5.0 cms L 5.5 cms 5.5 cms ABOUT PUPPY LOVE: Puppy Love is one of the most premium brands in the division of pet accessories in India. The company manufactures some of the most gorgeous looking leashes, collars, personalized name engraved collars, pet foot care materials ranging from anti skid shoes to water proof socks, blankets and other cute stuffs. All items of Puppy Love give a scintillating look to your pet – as if they are dressed up for a party. The designs of Puppy Love are exclusively designed and finessed by pet lover Nirja Puri.